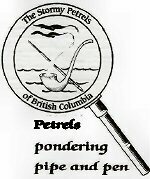 The Stormy Petrels of BC enjoyed a lovely brunch in celebration of Sherlock Holmes’ Birthday. There were 18 members and guests plus 3 newly signed-up members. Thank you to the White Spot for the use of their private room (with fireplace). Looking ahead, we can look forward to many more special events, more scholarship and more Sherlockian fellowship with visitors from abroad. Please contact Fran, your “Consulting Detective” if you are not already a member and would like more information.